Back to our BUYING BOULES page. Soft pétanque (or pétanque molle) are toy boules that look like a cross between a bean-bag and a little soccer ball. They not very useful for practicing your game indoors… they don’t weigh or play very much like real steel boules. These soft boules are no longer being manufactured. Avoid the Sportcraft bean ball bocce. They are basically sand-filled bean bags and very poorly made. The boules’ behavior on a hard, smooth, and even surface is very similar to the behavior of classical steel boules on outdoor clay surfaces – the boules do not “roll away” after hitting the ground, but gradually slow down. Plastic boules are made of resilient PVC filled with an “inert powder” to guarantee their proper behavior. It is possible that these boules are essentially similar to the boules souples described below, and that they are inflated with air and iron filings (the “inert powder”). Online vendors for these boules include Pen-y-Coed in the UK (which sells them as Indoor Training Boules – ITB), the boutique at www.boulistenaute.com, and other online boules vendors. Prices seem to range from roughly 45€ to 66€ per set. The best price we found was at petanqueshop.com. Each set contains six boules— two differently colored sets of three boules. Some sets seem to come with one jack; others with two. Note that it is possible to get replacement or additional “soft PVC” jacks. In 2014, Jean-Pierre Albertini filed a patent application for “boules de pétanque souples d’intérieur“. Now you can buy a set for around 79€ at boulistenaute.com and and other online vendors. You can see some pictures of them HERE. A flexible outer shell or skin (4mm thick) partially filled with steel microbeads and then inflated with air (like a basketball) to produce boules with the desired weight, size, and bounce. The heavy microbeads help to suppress the inflated boules’ bounce, producing playing behavior similar to steel boules. (This is the same technique that old-time cheaters used to make “stuffed” boules— boules farcies.) One report says that they are 73mm and 680g. In this closeup you can see the valve used to inflate the boules. You can see the boules in action in this Vimeo video. As you can see, the jack has one flat side to keep it from rolling away too easily on the wood floor. For a long time I was deeply impressed with the design of the flexible boules, until I realized that the same technology has been in use for many years in the USA to create “slugs”, weighted training balls for baseball or softball, designed to increase the strength of batters and pitchers. In theory, it would be possible to use a baseball slug like a flexible boule, if one could get the right size and weight (about 3″ and 24oz). 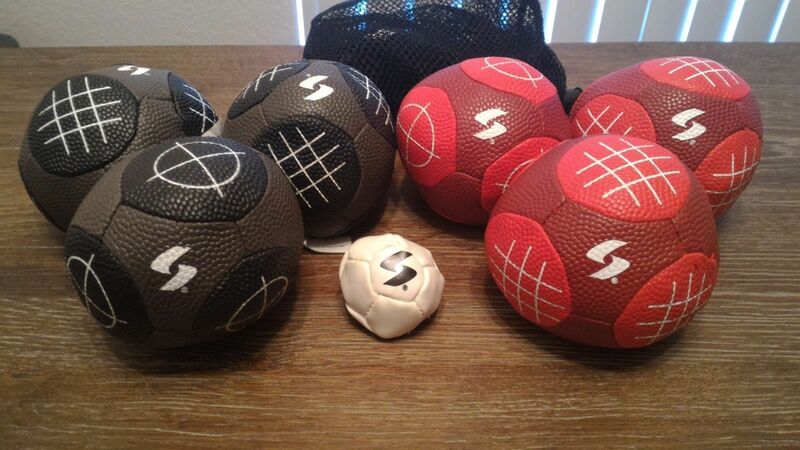 The closest match that I could find to those specifications were these Powernet weighted training balls at 2.8″ and 20oz. If you look for petanque molle (soft petanque) on French Amazon you will find a number of offerings for what are basically bean bags. Since they are very safe, and don’t roll at all, they are great for teaching young kids the basics of throwing.